Eclipse Collections became a reality at the Eclipse Foundation at the end of 2015. We had successfully migrated GS Collections to the Eclipse Foundation to become Eclipse Collections. An announcement was published at InfoQ in January 2016 on the migration. By partnering with the Eclipse Foundation, we hope to grow a vibrant and open community of contributors and committers around the Eclipse Collections project. The GS Collections project had only allowed contributions from Goldman Sachs developers. At the Eclipse Foundation, anyone can contribute to the Eclipse Collections project as long as they sign the Eclipse Contributor Agreement. At the time of the move to the Eclipse Foundation, GS Collections had reached 1400 stars on GitHub. After three years of hard work, Eclipse Collections has reached the milestone of 1000 GitHub stars. I marked the milestone in Twitter. With 49 contributors so far, we are realizing our dream of building a vibrant and open community around Eclipse Collections. Contributors are welcome here! Although GS Collections is no longer actively developed, it has continued growing from 1400 stars in 2016 to over 1700 on GitHub today. 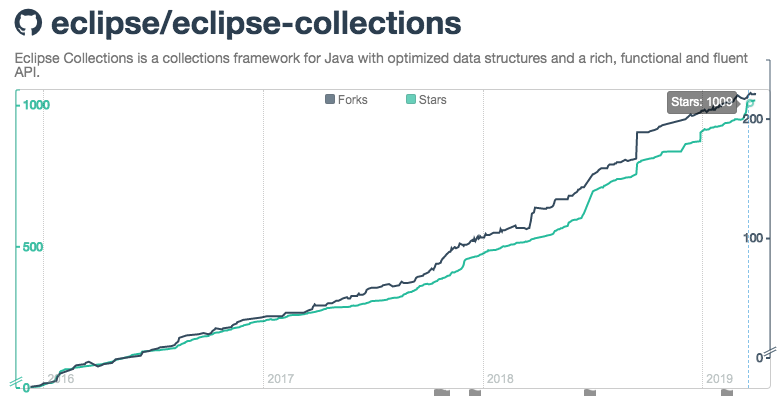 Eclipse Collections started at zero stars in 2016 and passed the 1000 star milestone earlier this month. This has been thanks to the support of our growing community. 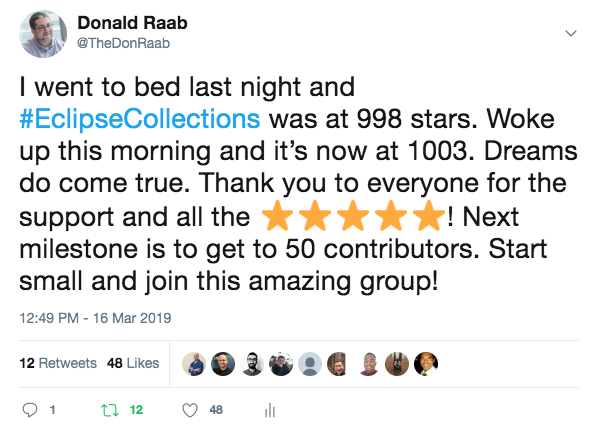 We are fortunate to have some motivated and inspirational Eclipse Collections advocates who help us raise awareness by acting as information radiators and amplifiers. I gave a talk at the Open Source Strategy Forum in 2017 which explained some of the things we have done to help increase awareness of Eclipse Collections. The title of the talk was “They Can’t Hear You On Mute.” It took a lot more than this to get us here. There is no “I” in Open Source. We got where we are today because we worked hard to build a community of energized contributors and vocal advocates. The success of Eclipse Collections has been driven by the support of its vibrant and open developer community. The first thing we had to do was build this community from the ground floor. We actively encourage developers to contribute to the project in numerous ways. We have promoted the approach of using code katas for learning and teaching the framework. The code katas for Eclipse Collections can be found here. One of the greatest contributions someone can make to a framework is to learn it, use it and then to teach it to others. 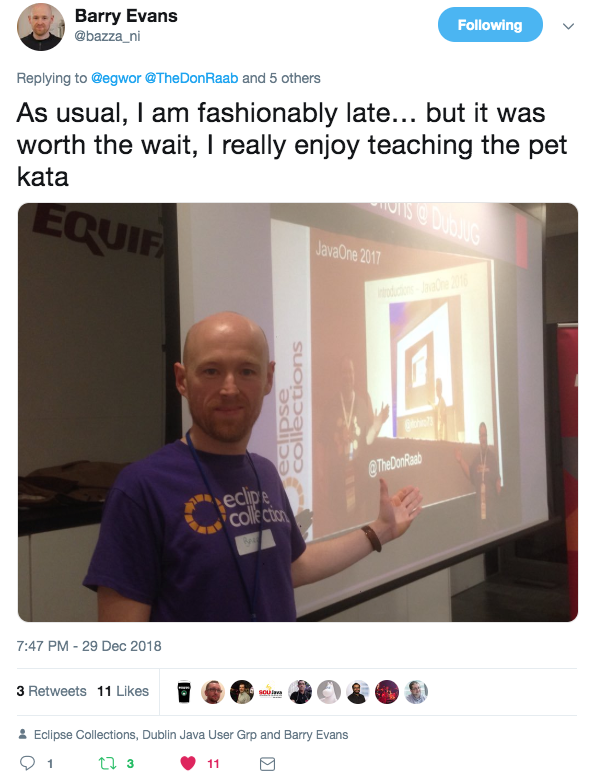 The Eclipse Collections Kata was taught recently at a Dublin Java User Group meet-up. Teaching is the best way to learn, and a great way to contribute. Thank you to all the teachers! We’ve seen multiple blogs and articles written by members of the community, in addition to many tweets. We continue to make rounds at conferences and Java User Group meet-ups, and are happy to hand out Eclipse Collections stickers to anyone who wants one. Every little bit helps. Thank you to everyone who has contributed to our success. The committers on the project balance their day jobs with engaging with the open source Java community at tech conferences, on Twitter, writing blogs and articles, reviewing issues and pull requests, and occasionally adding new features to the framework. Our role as committers has changed significantly from the days when we were primarily contributors and our focus was to write code we needed for the projects we worked on. Our job now is to raise awareness, provide training, increase adoption, encourage and promote the contributions of others, and continue to build the community. We are actively looking out for developers who are interested in vesting themselves in the framework to the level at which they can become the next committers on the project. You can become a Committer and even Project Lead on an open source project if you set that as a goal and demonstrate you are vested in supporting the project. Below is a link to a great blog post which explains the process of becoming a Committer on an open source project at the Eclipse Foundation. We received our 1000th commit on the same day that we reached 1000 stars on GitHub. 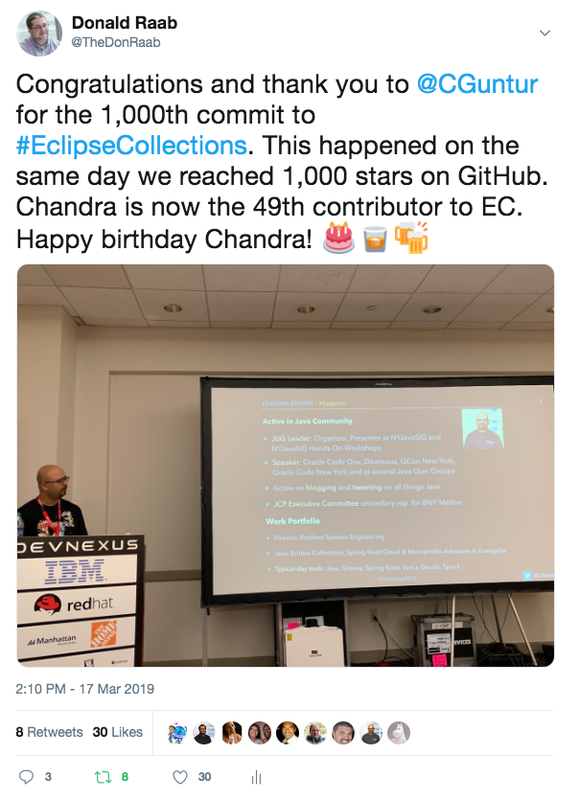 Thank you to our entire Eclipse Collections developer community for helping us reach this second amazing milestone! If you look at the activity in Eclipse Collections since the beginning, you will see a fairly steady flow of work being contributed by our amazing community. It is a nice milestone to have now passed 1000 commits, and it was cool to unlock this achievement on the same day we passed 1000 stars. I gave a shout out on Twitter to the developer who helped us pass this milestone. Thank you to all of the contributors who helped Eclipse Collections reach 1000 commits. In 2018, the greatest surprise contribution from the open source community came in the form of Jackson serialization support for Eclipse Collections types in the jackson-datatypes-collections project. This is an amazing contribution to all users of Eclipse Collections who also use the Jackson library for serialization support. We literally did not see this contribution coming, until it arrived. I had hoped someone would be interested in providing this support, and I am very thankful to the developer who worked on it. Star this repo if you use a third-party collections library and benefit from the the Jackson serialization support provided by one of the amazing developers who contribute their time and energy to make our lives as developers easier. 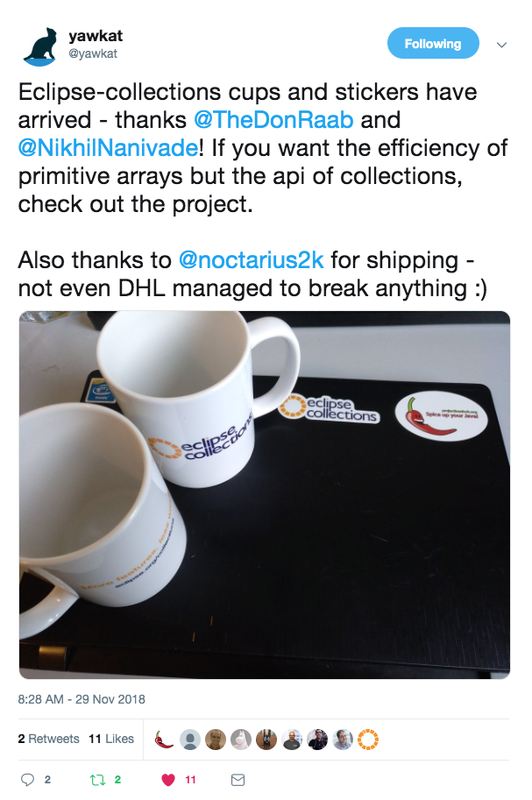 We sent some Eclipse Collections mugs and stickers to the developer who made this awesome contribution to the open source Java community. Be willing to be surprised, and remember to say thank you. What’s next for Eclipse Collections? We’re hoping to see our 50th, 60th, and maybe 100th contributor, and our 6th, 7th and maybe even 10th committer by the end of 2019. We appreciate contributions of any kind. No contribution is too small. We’d also like to pass 2000 stars in 2019. We can’t get there without further building our community, so expect to see some energized Eclipse Collections advocates presenting at technical conferences and Java User Group meet-ups throughout 2019. We will be releasing version 10.0 of the project in the next few months. The project has become stable enough that we have not done a major release since September 2017. The addition of default methods in Java 8 has made it possible for us to safely release API changes in minor releases, so the 9.1 and 9.2 releases had quite a few new APIs added. Eclipse Collections is an open source project built by an amazing developer community for an amazing developer community. We love Java, and we are thankful to the Eclipse Foundation for giving us a great place to build our community. Thank you to all those that have helped the project reach this stage in its evolution. Thank you to all those that continue to help us as we move the project forward and as we look to build our community further. I hope this blog reaches developers out there who have been interested in joining an open source community and making their first contribution. 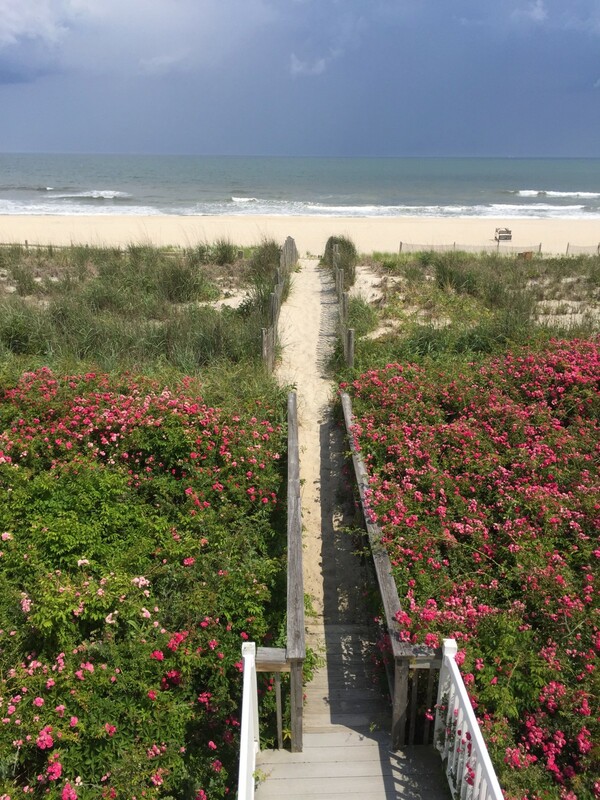 We are here and happy to help you take that first step. Eclipse Collections is open for contributions. If you like the library, you can let us know by starring it on GitHub.